Before I proceed, may I state categorically, that IPOB's plan to boycott Nigerian election is not for the purpose of displacing or ousting any politicians but it is to emphatically and strongly disassociate ourselves from the criminality, fraud, tyranny and retrogression that this evil and abominable entity called Nigeria has become. And also, to strongly register our displeasure over the faulty foundation upon which Nigeria was built and managed, and again how this union for so long has kept us backwards and brought death upon death to the people of Biafra. For the past fifty-eight (58) years of Nigeria's independence, as a Biafran, ask yourself what has your voting benefitted you if not deaths, marginalisation, sufferings, injustices, and lately totally exclusion from all sectors of government. Nigeria has gifted us nothing good but only agony, mourning, injustices, marginalisation, deaths upon our people, old and young including children through government systematic unfavourable policies targeted against us. A wise man said "It is only a foolish person that will keep on repeating the same thing and be expecting a different result". Look at the current structure of this country Nigeria and ask yourself, is there any hope for the so-called south east in Nigeria? Of course, the answer is capital NO. Will there be any hope for a better future if we continue to vote and stay in Nigeria? Again, no hope for a Biafran in Nigeria. Okay, let me refresh your memory with just one example. On 2nd June, 2017, a law maker from the south east Chukwuka Onyema presented a bill that sought to establish a Development Commission for the so called south east zone of the abominable entity called Nigeria to tackle among other things many years of infrastructural decay in the so called south east region. And immediately the law makers from other regions of the country ganged up and killed that Bill instantaneously without a second thought. That is how much Biafrans are hated in Nigeria and are not wanted in Nigeria, but allow them to go their separate ways, they still say no, because they want them to continue to suffer despite the huge deposit of oil and mineral resources, (OIL AND GAS) in Biafra land which fraudulent Nigeria and evil Britain are being sustained with. The only bill that would have benefitted the people of the south east which are Biafrans was killed instantaneously, thereby leaving the people to wallow in pains, agony and to sort themselves out anyhow they want. Now I ask you Biafrans, what is the benefits of your votes since those people in the national assembly does not have the number that could get the region any development from the government due to systematic marginalization? And to the occupational government of Nigeria, south east region which are Biafrans does not deserve any development? Then, what's the essence and need of queuing in the line to waste time in the name of fraudulent Nigerian selection called election? This the time ALL Biafrans should stand up and be counted and against these monsters and demand for total freedom which is a chance for us to politically determine our future, rule and manage our resources by ourselves. If anyone comes to you and promises you that your votes this time will make a difference by bringing the change you required, don't listen to such a deceiver. He is an agent of the oppressive government of Nigeria. There is nothing good that will ever come out of this abominable country called Nigeria again. The country has expired and health wise, it is not good and favourable to you as a Biafran. So, the best thing and only solution for us is Biafra sovereignty. And that is why Indigenous People of Biafra (IPOB) ably led by Mazi Nnamdi KANU has called for a referendum for Biafrans to decide either to continue being slaves in a Nigeria that has expired in 2014 or go and build their own nation Biafra. A nation they can call their own and where they will be safe and not been killed at will through government sponsored killings. When they tell you "go get your PVC" and vote for A or B, don't be fooled again this time, tell them you have had enough and that you are for Biafra Referendum and referendum is the only voting you are willing and prepared to participate in again. As Biafrans, total boycott is required from every indigene of Biafra. They have killed us in millions, cheated us greatly and we say never again. 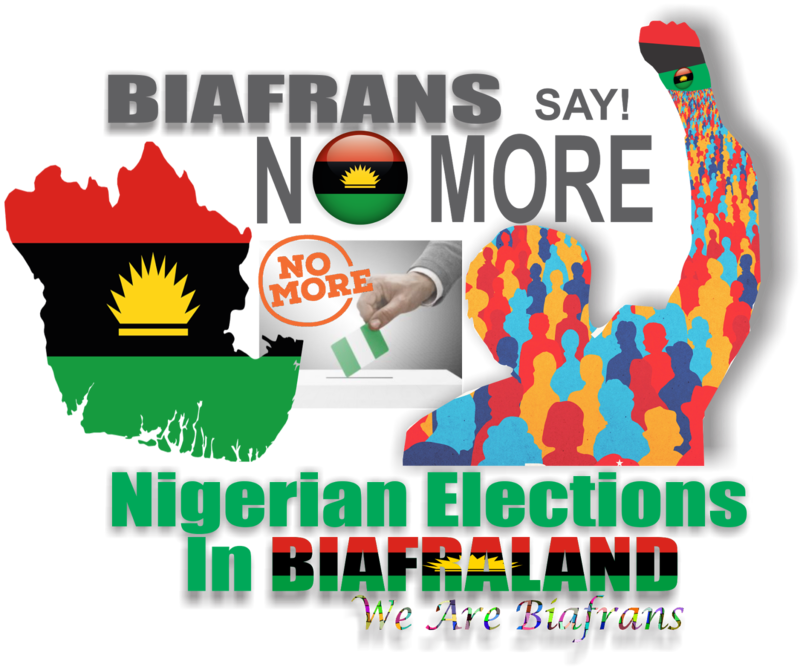 Yes, election boycott will not give us Biafra immediately but it will send a strong message and signal to the world that indeed we are tired. It will also give them the opportunity to know who the aggressor and oppressor is. For so long, the world has stood and watched the occupational Nigerian government maltreat us and they did nothing about it. The only option we have right now is to totally boycott all Nigerian elections from local government elections, to state elections and to federal government elections. Our demand is simple, give us a date for referendum and not election that will never benefit us, but instead enslave us the more. By the time, we totally refrain ourselves from all their political systems, they will know truly that we are no longer interested in anything that has to do with this British fraud called Nigeria. This call for referendum is a call for peace and freedom and not a call for war. And at this point, every Biafran is duty-bound to strictly obey and adhere to this call and abstain from all Nigerian elections and politics. God bless Mazi Nnamdi KANU wherever he is.